Access to the facility is from the driveway bisecting Pier 9. 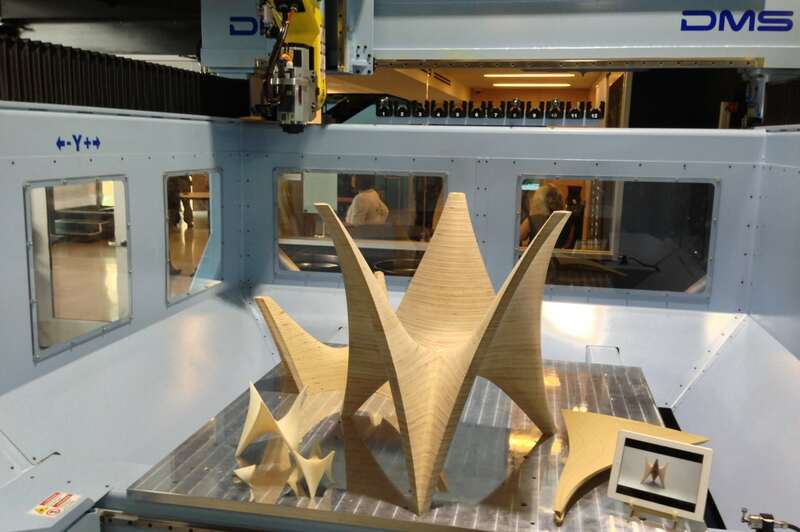 This table base was designed by Autodesk CEO Carl Bass and made from many layers of plywood. Jet cutters can cut through a range of materials such as metal using a powerful jet of water mixed with an abrasive. 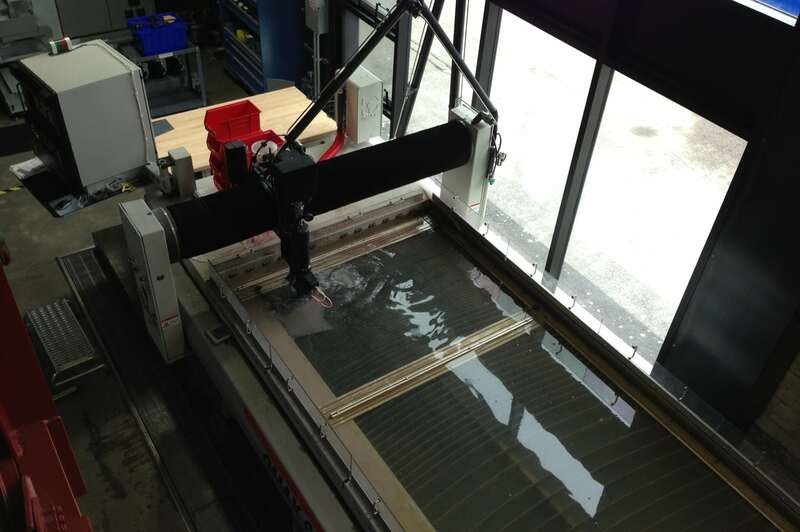 An Autodesk employee removes finished metal pieces from the water bath. 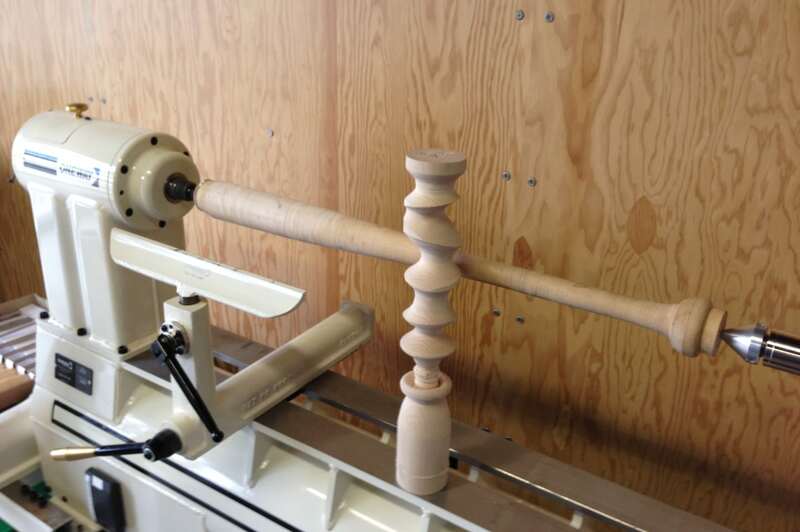 An Autodesk artist-in-residence making stands for wine bottles. The wood shop contains a range of standard---even old-fashioned---machines for woodworking. 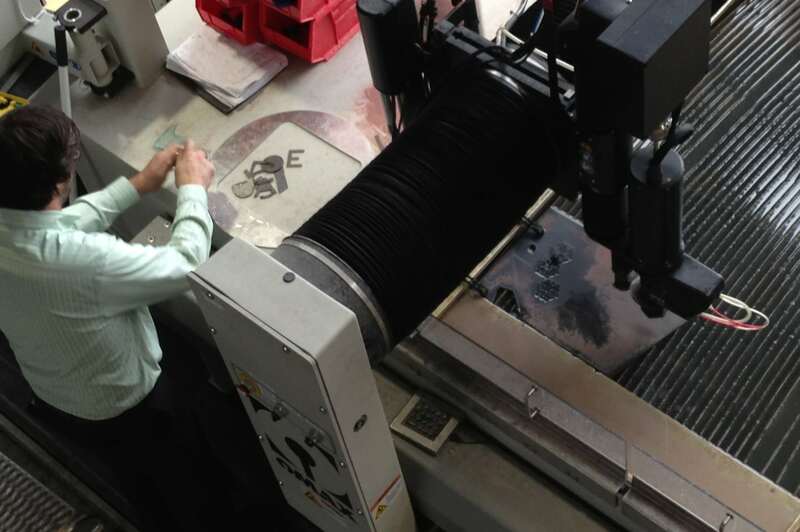 The workshop's 3D printers can be used to create almost any shape from acrylic or ABS (acrylonitrile butadiene styrene). 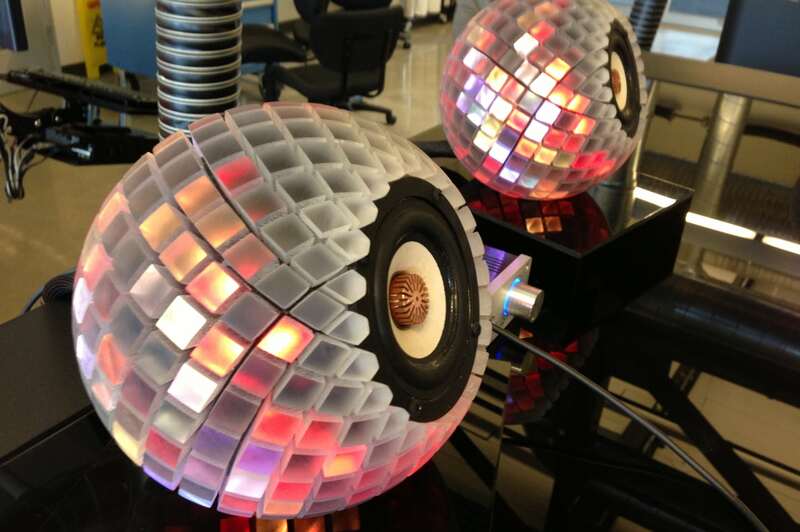 The cases for these speakers were made using a 3D printer; LEDs inside provide a light show. 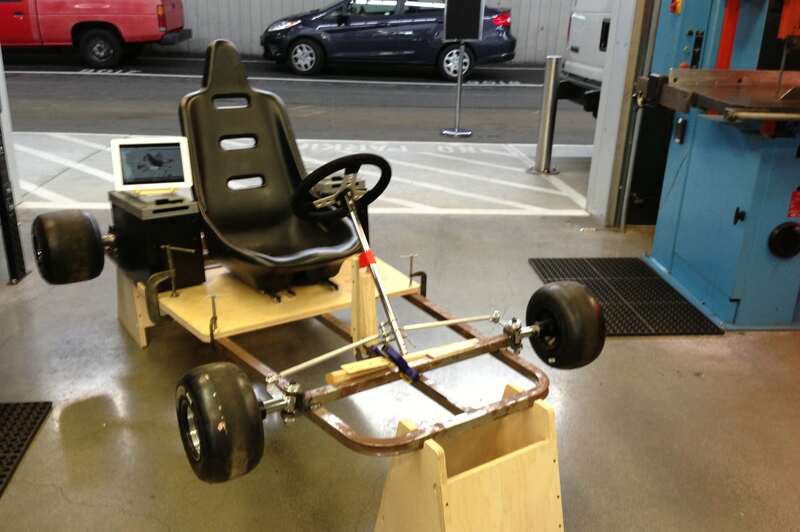 Autodesk CEO Carl Bass and his son are using one bay of the workshop to build an old-fashioned, yet high-tech, go cart. Outside artists invited to use the Autodesk Workshop can organize their projects here. 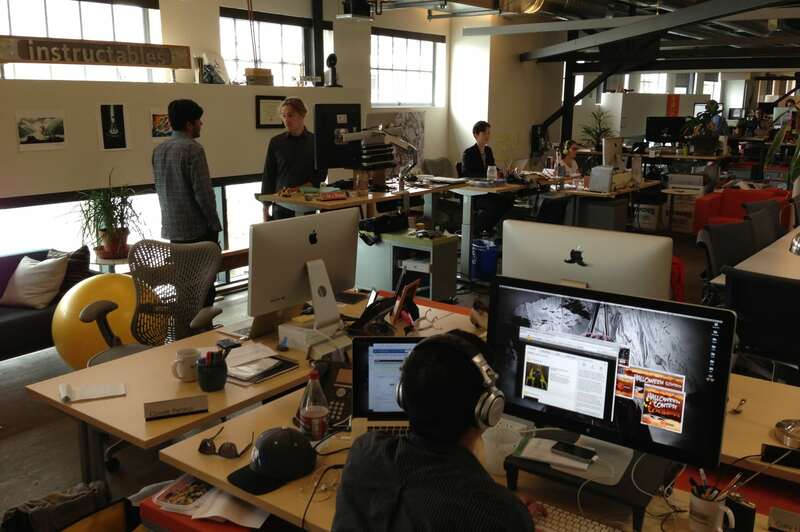 The staff of Instructables occupies a central space on the workshop's second floor. Construction crews built the alcove shell from a design created in Autodesk's AutoCAD software. 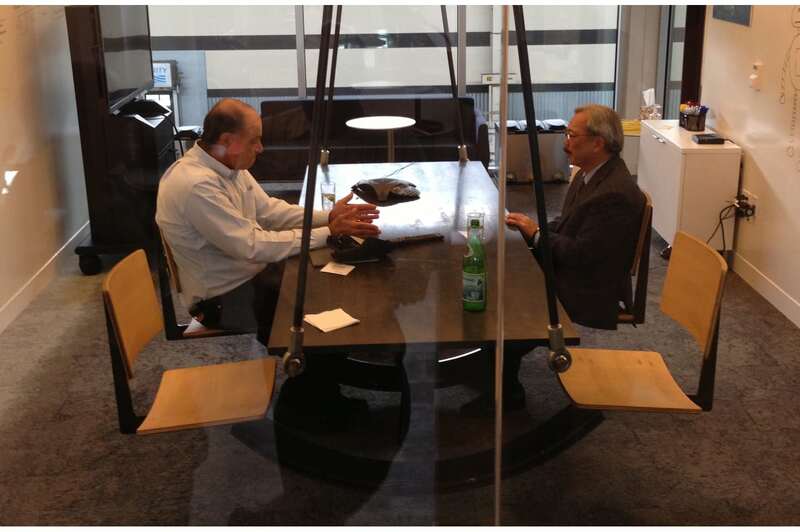 Autodesk CEO Carl Bass and San Francisco Mayor Ed Lee confer at a swinging table suspended from the ceiling. 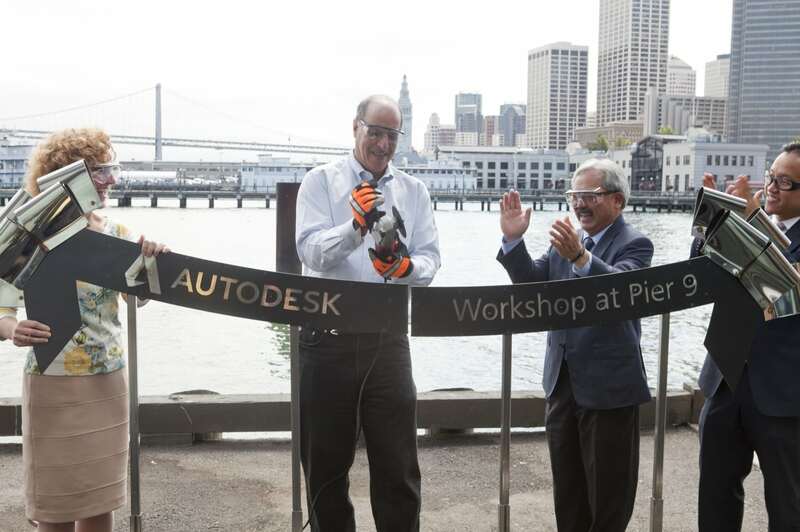 No regular ribbon would suffice for the opening of Autodesk's workshop---engineers built one from steel. Bass cut through it with a power saw while Mayor Lee looked on. 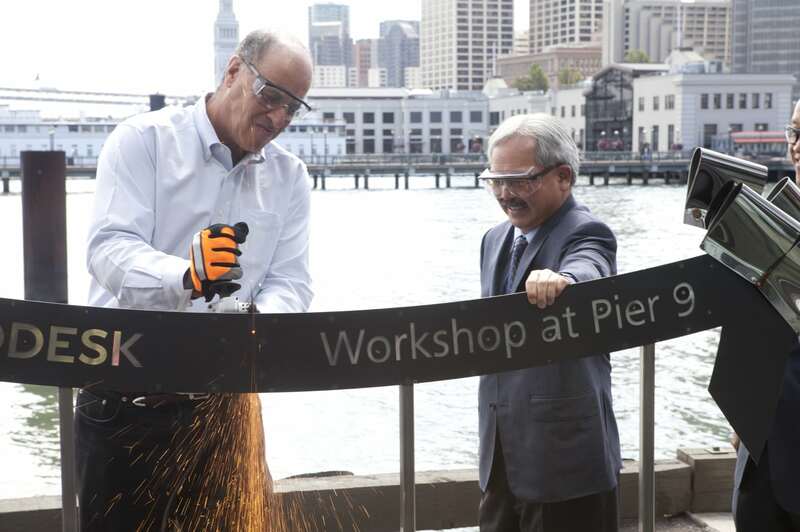 The leader of the San Rafael, CA-based design software maker was speaking last week at the official opening his company’s newest facility, a state-of-the-art fabrication workshop on San Francisco’s Pier 9. 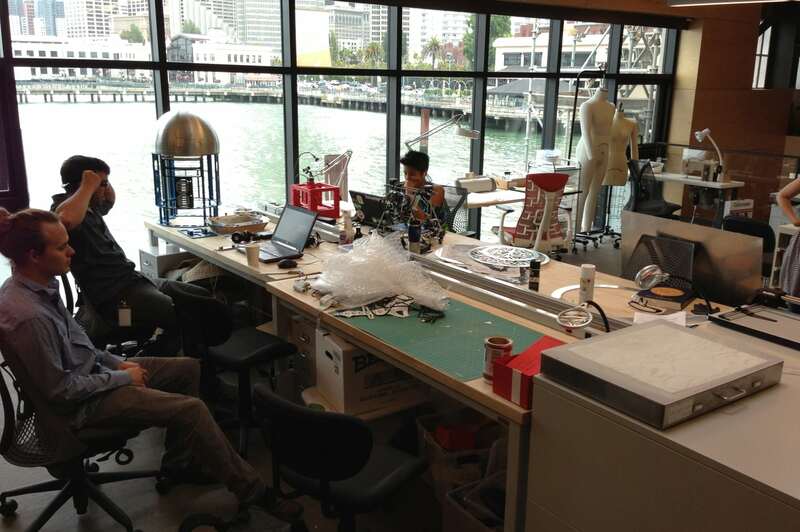 A stone’s throw from the new Exploratorium, the workshop is designed to serve as a showcase and idea laboratory for Autodesk (NASDAQ: ADSK), while at the same time boosting efforts to bring more high-tech businesses to San Francisco’s historic Port district. The 27,000-square-foot facility, which occupies the southern half of the pier, features a 3D printing lab, a fleet of huge computer-controlled rapid-prototyping machines, metal and wood shops, and office and conference space. It’s also the new home for Autodesk’s consumer products group, as well as an advanced research group in synthetic biology and nanotechnology. 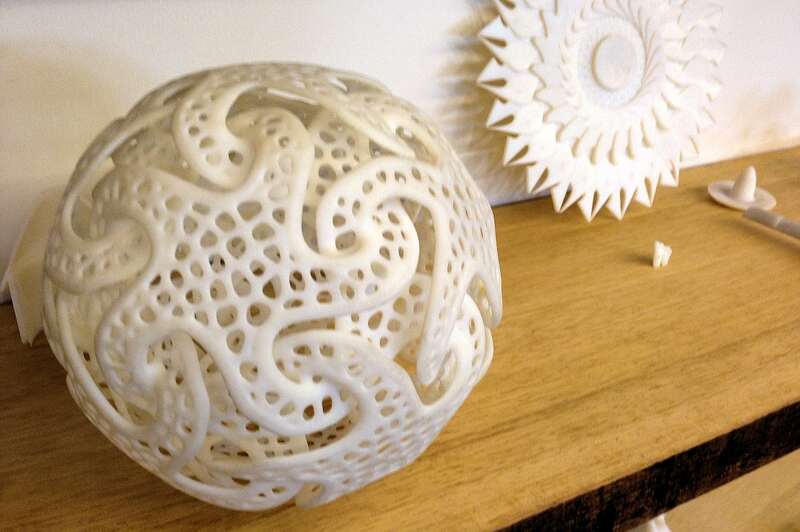 A large fraction of the objects manufactured using the latest generation of 3D-printing or fabrication software are designed using Autodesk programs like AutoCAD or 123D Design, 123D Make, or 123D Sculpt. Strangely enough, though, Autodesk itself never owned the right equipment to test out this process in-house. That was a big part of the rationale for building the new workshop, Bass says. At the same time, the company needed a better home for Instructables, the how-to site for makers that Autodesk acquired in 2011, and for the teams behind the free 123D consumer apps. 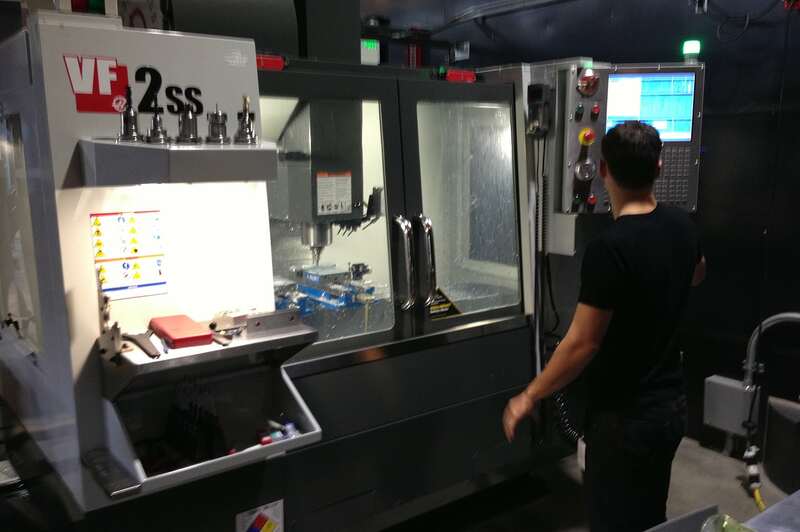 “Carl was instrumental in helping us choose the equipment that is here, and I can assure you that [he] is quite capable of operating everything in this shop,” said Chris Bradshaw, Autodesk’s chief marketing officer, at the opening ceremony. 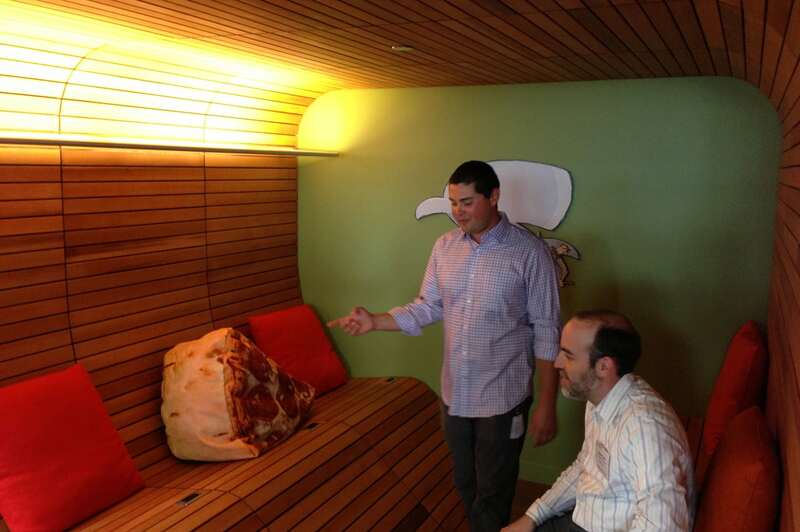 For Eric Wilhelm, the MIT-trained co-founder of Squid Labs who went on to start Instructables in 2005, the new facility is a huge improvement over his old digs: a cramped, cluttered office on the second floor of an old building on 2nd Street in SoMa. Autodesk had three specific reasons to invest in the new workshop and the expensive machines inside, Wilhelm says. “Number one, hardware-software interfaces are becoming more important to our business, and we needed deep, hands-on experience dealing with those, making sure our software and [other companies’] hardware work well together,” he says. 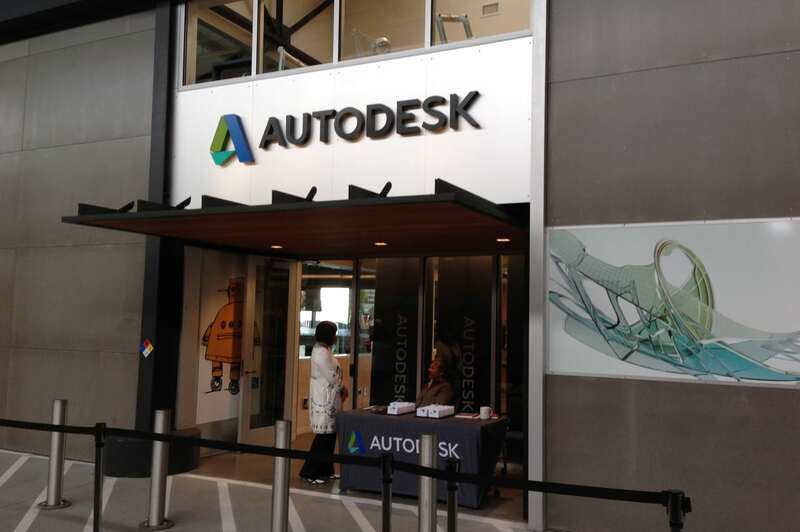 Secondly, Autodesk wanted a demonstration space where it could showcase the new technologies and their products. For instance, the room with Autodesk’s new laser cutter, metal milling machines, and water jet cutter features a second-story catwalk where visitors can peer down and watch artists and technicians at work. As one example, Wilhelm points to a project by Instructables engineer Amanda Ghassaei to use the lab’s 3D printers to convert digital files into translucent photographs and playable 33-rpm records. “I’m hoping to have all kinds of projects that make us think and inspire us as a company,” Wilhelm says.